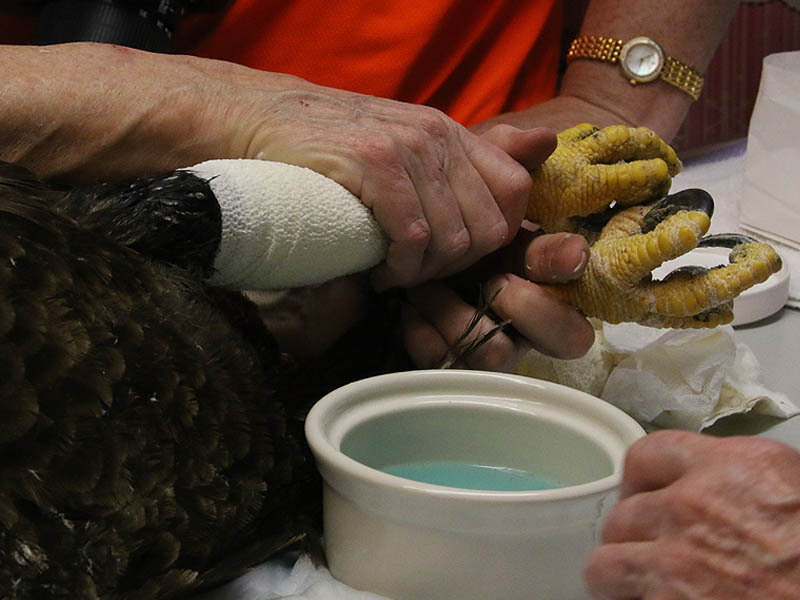 Wildlife rehabilitation is a challenging endeavor even under the best of circumstances. Wild animals—especially adult wild animals—are often stressed by the handling required during the rehabilitation process and can be resistant to receiving care. Some animals do not do well when kept in enclosures. Other cases involve injuries that are so severe that there seems to be little hope for a full recovery. And sometimes you can be dealing with a rare, endangered, or iconic animal for which a negative outcome would be particularly devastating. So, what do you do if you get a case where all of these factors are in play? Well, if you are a member of the staff of Rogers Wildlife Rehabilitation Center, you roll up your sleeves and you go to work. 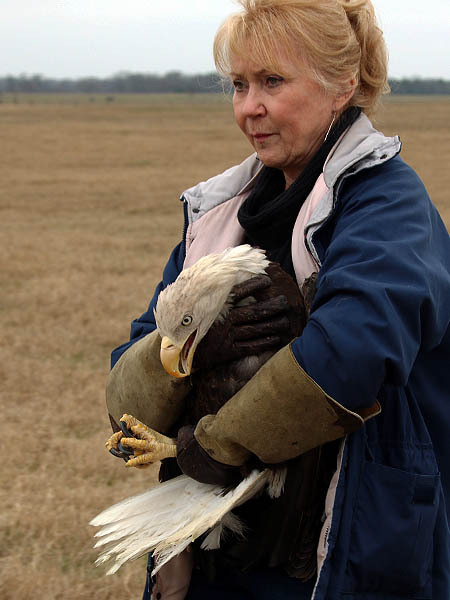 A little over a year ago on December 21, 2013 reports of a Bald Eagle acting strangely and possibly in distress came to Kathy Rogers at Rogers Wildlife Rehabilitation Center from TPWD Game Warden Martin Oviedo. The eagle was discovered by Graeme Geisendorff of Rowlett, Texas when he stepped outside to investigate what was upsetting his dogs. The eagle was on the ground in Graeme’s backyard and it was easy to see that something wasn’t quite right with the bird. 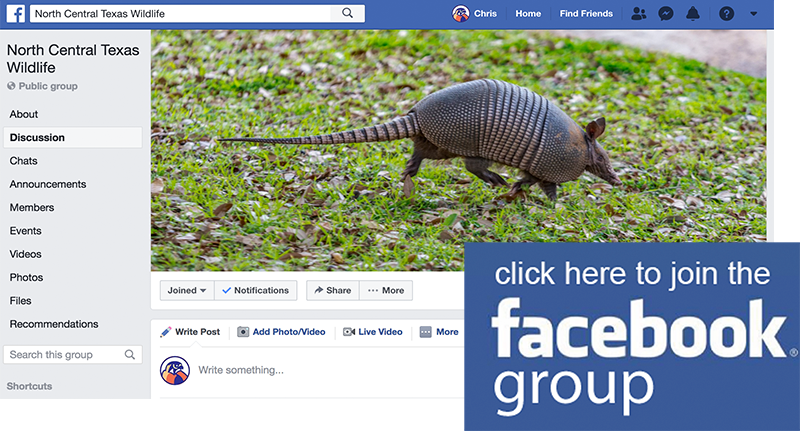 Graeme contacted Rowlett Animal Control, and they in turn contacted the Texas Parks and Wildlife Department Game Warden. Martin knew just who to call. 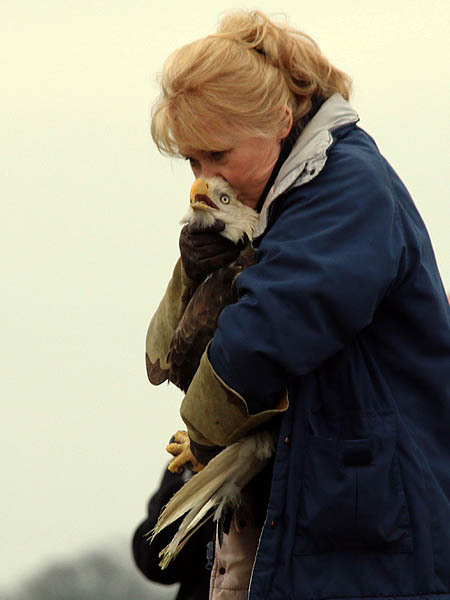 Kathy rushed out and quickly sized up the situation—the eagle was in such a weakened state that a capture could be attempted. 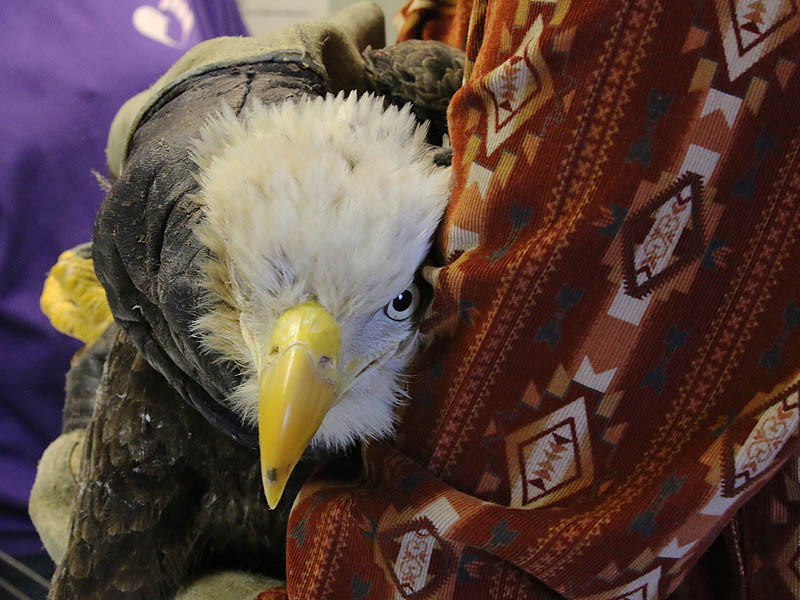 It was unlikely that the eagle could fly in his sorry condition, but care would need to be taken in order to ensure that the capture went smoothly. It was very important to avoid further injury to the eagle and subjecting him to unnecessary stress. Allowing him to escape in this condition was also out of the question. 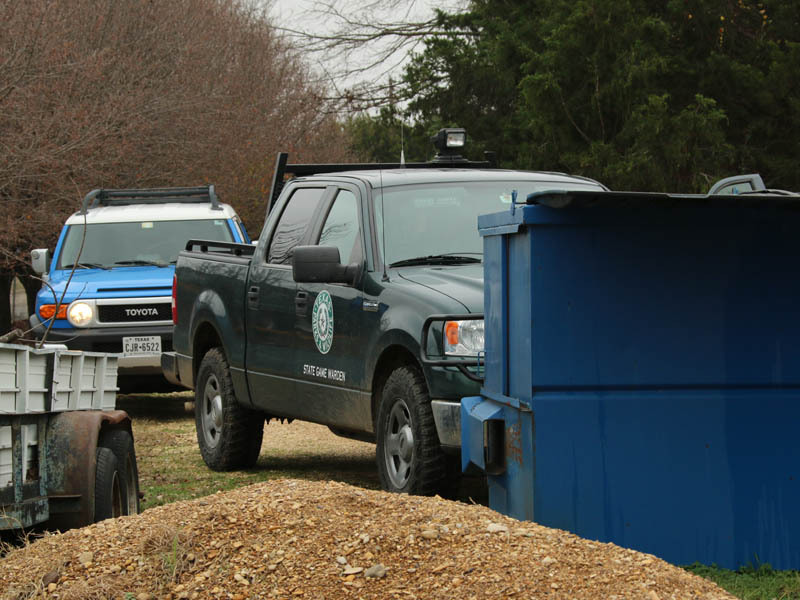 In a Rowlett backyard—cold, wet, and severely injured – Photograph courtesy RWRC. 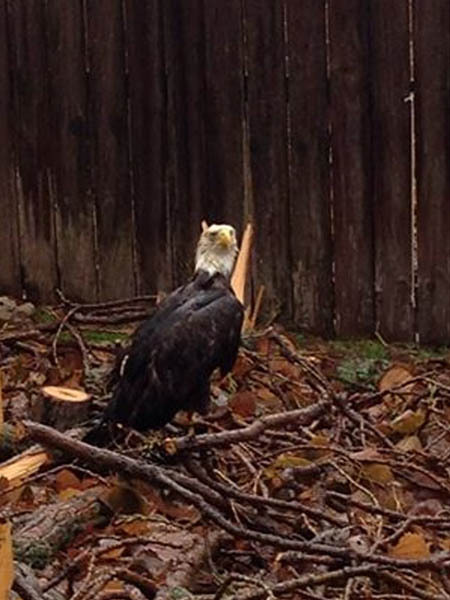 The eagle was in dire straits when found. He was cold, wet, and severely injured. From the looks of things this eagle likely came out on the losing end of a battle with another eagle—almost certainly over food or territory. His injuries were very grave and included a rampant eye infection due to a punctured cornea. To make matters worse the eagle also had a large fleshy wound on its left leg and other serious lacerations on his head, wings, and feet. The eagle was dramatically underweight. 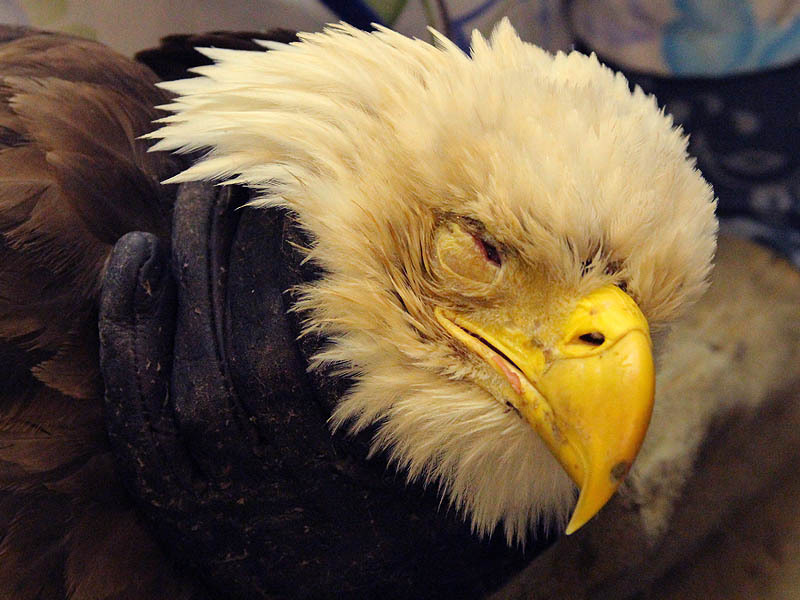 His injuries had taken their toll over time and the eagle was unable to hunt and feed himself. A downward spiral resulted. Without being able to acquire the food he needed the eagle’s wounds could not heal properly and he continued to grow weaker. When he was finally found in Graeme’s backyard the eagle was spent and exhausted. He was on death’s doorstep. 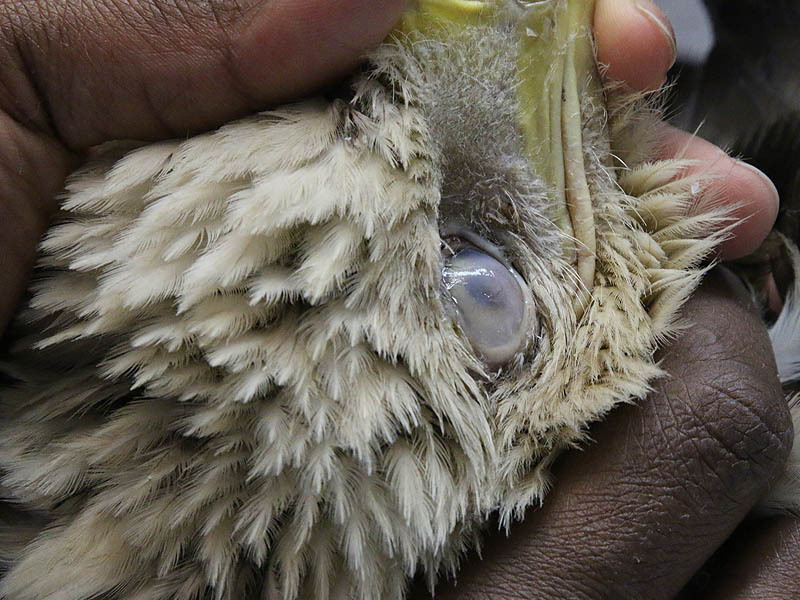 The eagle’s injured eye—a punctured cornea and severe infection – Photograph by Penny Halstead. 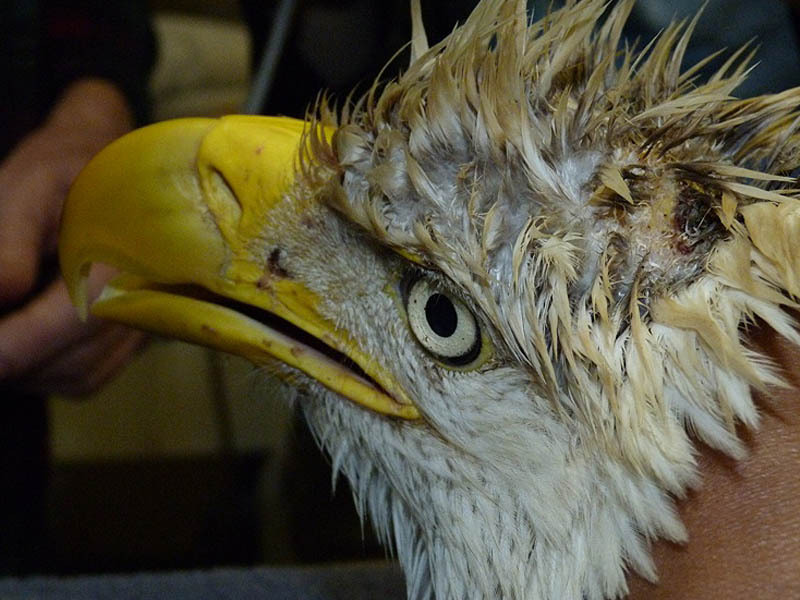 Multiple laceration on and around the eagle’s head – Photograph by Penny Halstead. 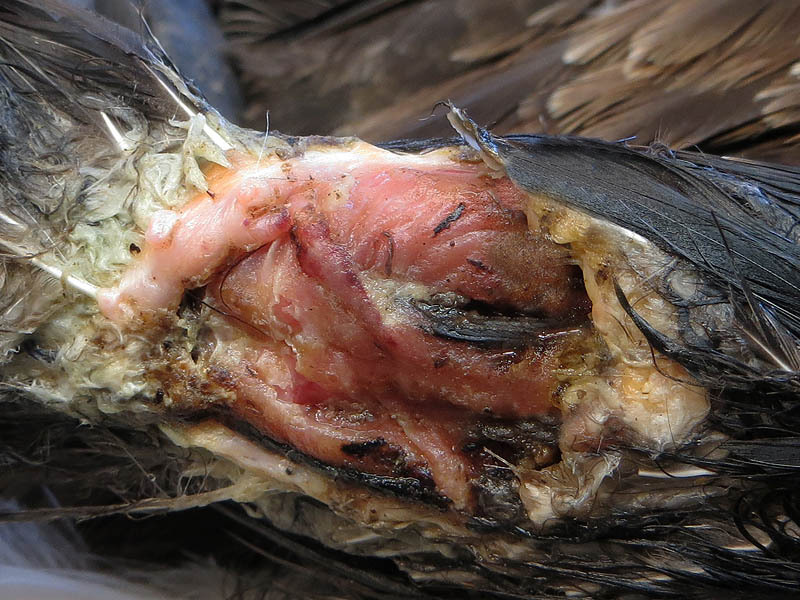 Severe wound to the eagle’s left leg with necrotic tissue – Photograph by Penny Halstead. 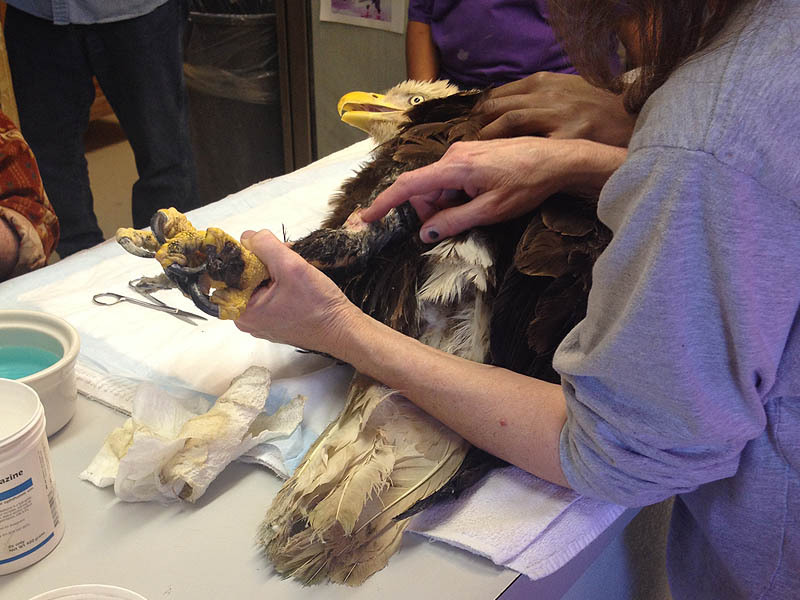 The eagle’s feet had many laceration. Notice the nearly two inch long talons! – Photograph by Penny Halstead. 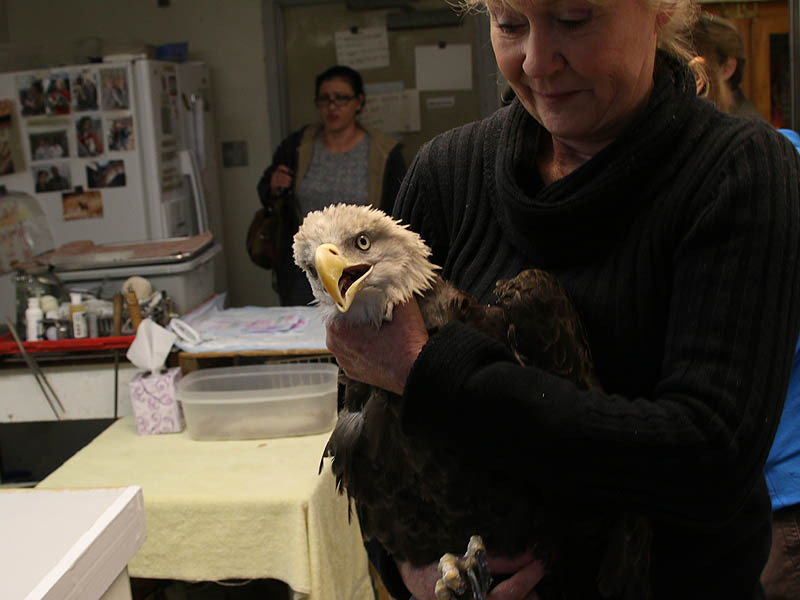 Back at the center, Kathy and her staff went to work to stabilize the injured eagle. He was warmed and his wounds were cleaned and bandaged. It was determined that the eagle was a male and at least five years old. The condition of the injured eye was especially concerning and required a visit to local veterinarian who specialized in Ophthalmology. 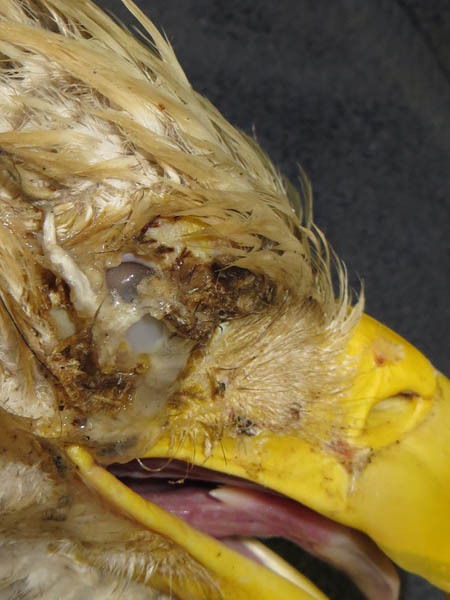 The veterinarian diagnosed the eagle with something called a “melting cornea”. The bird was put on a regiment of antibiotics—both oral and topical. A special serum was created for treating the eye injury requiring drops to be applied three times a day. The leg injury was also of major concern. There was worry that some functionality may be lost. 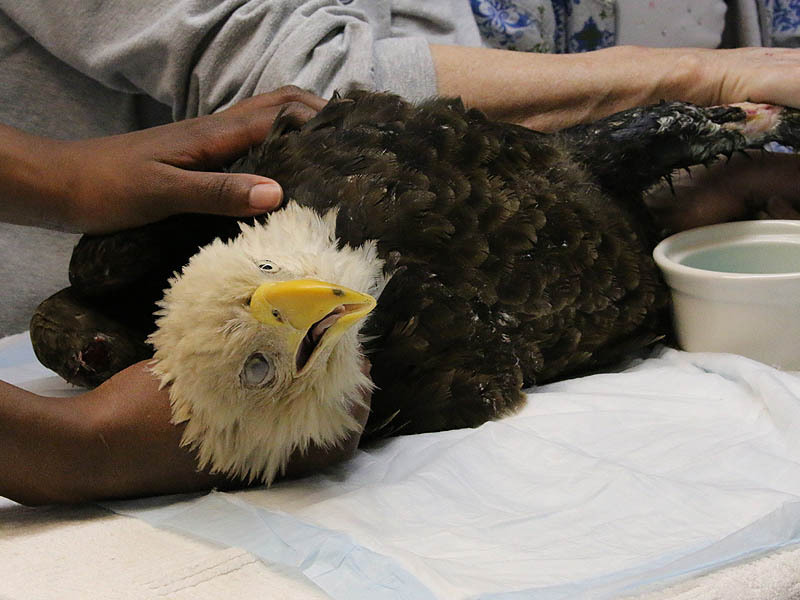 The eagle would require much special care in order to have the best chance for a good recovery. 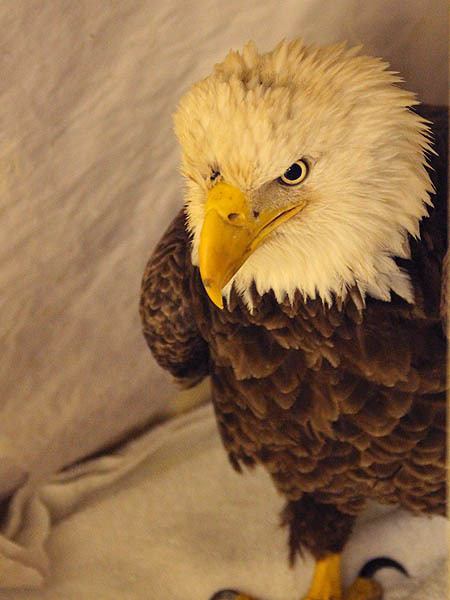 While he was undergoing treatment, the eagle would be kept in a special indoor enclosure at the RWRC until he was eating well and had regained some of his strength. To this end he was fed a rich diet of salmon, beef heart, and mice to aid his recovery and help him put on weight. 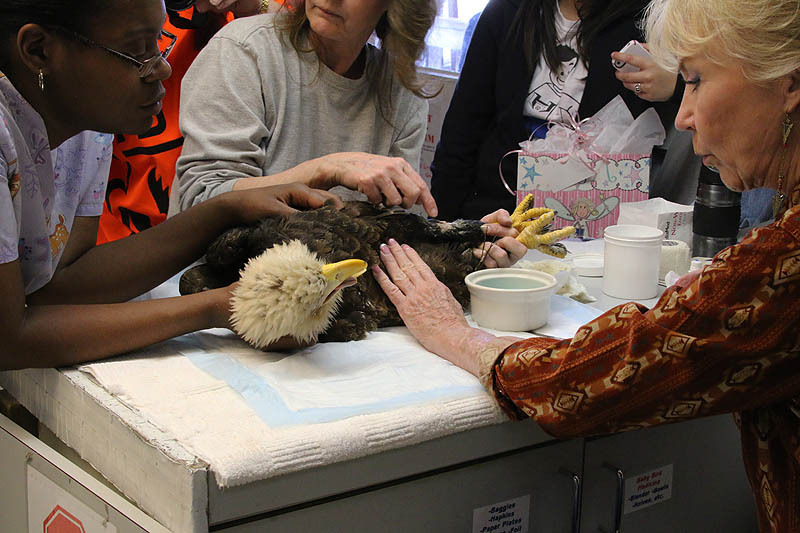 A few days later I was invited to stop by to see the Eagle’s condition for myself. 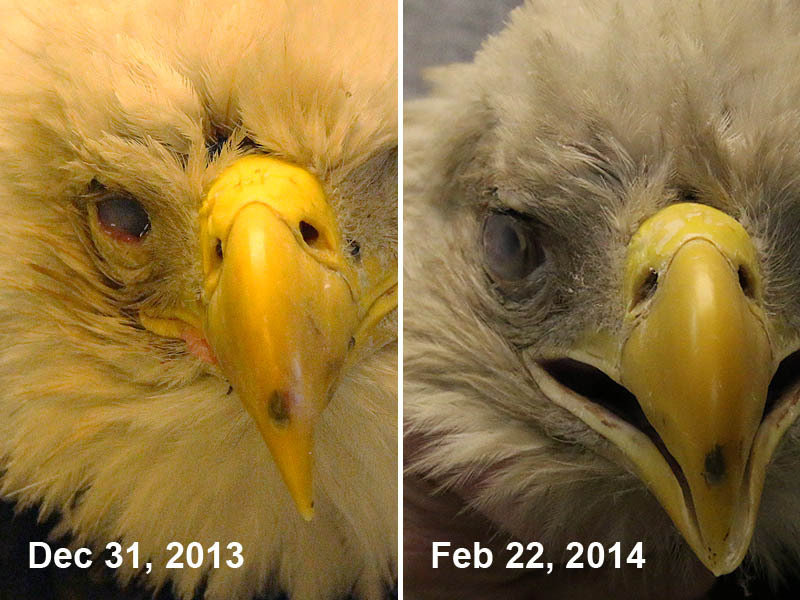 The Eagle was in haggard shape, but his health was already showing signs of improvement. Even though he had made significant progress since he first arrived at the center, his wounds were still difficult to look at. It was hard not to wince while watching the staff work on the bird. Of note, though, was the eagle’s composure through it all. 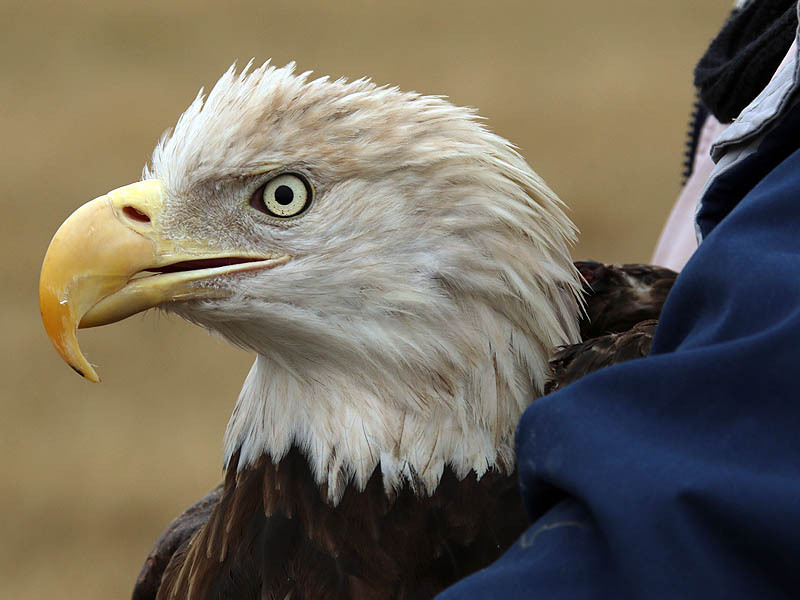 Despite his injuries, the unusual environment, the presence of numerous people, and much handling the eagle did not appear to be overly stressed by it all. This was certainly to be a important factor in his ability to accept treatment and eventually recover from his wounds. Just a few days later and the eagle was already showing significant improvement. Cleaned up and on the mend. The injured eye is much improved, but still has a long way to go. Comparing the injured eye to the heathy eye. A closer look at the uninjured and healthy left eye. An injury near the tip of the beak and another across the bridge. The eagle in his temporary padded enclosure. 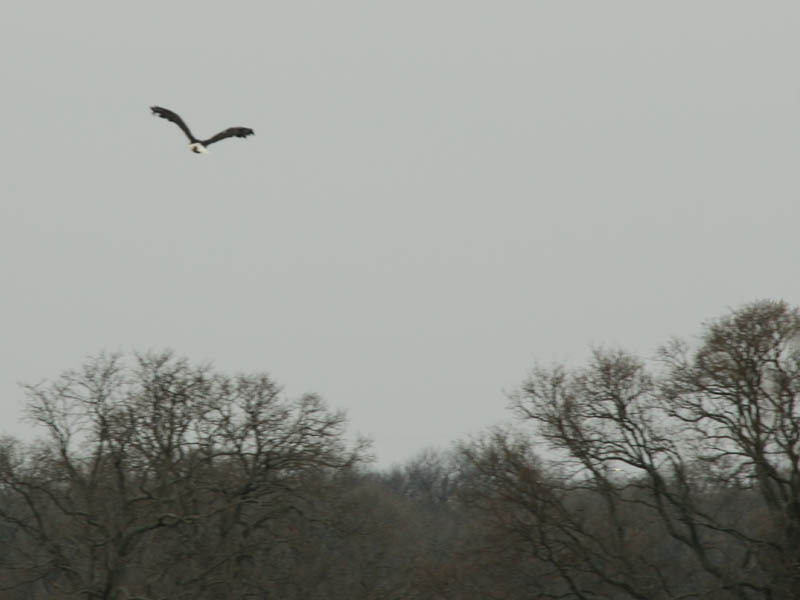 I returned again in February to check on the eagle’s progress. I was pleased to find that there had been much continued improvement, but the eagle still had a long way to go before he would be healthy and releasable again. 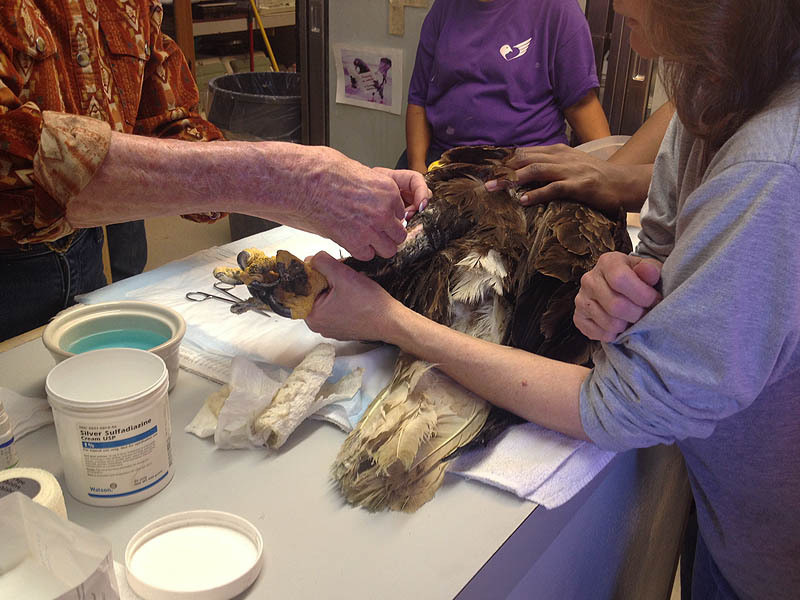 As I noted earlier, the eagle had to endure frequent handling during the initial stages of his treatment. It was critical that he be gently but effectively restrained during these procedures in order to prevent the bird from injuring himself further. This had the potential of being extremely stressful for the bird, but this eagle was a trooper and he tolerated these sessions well. 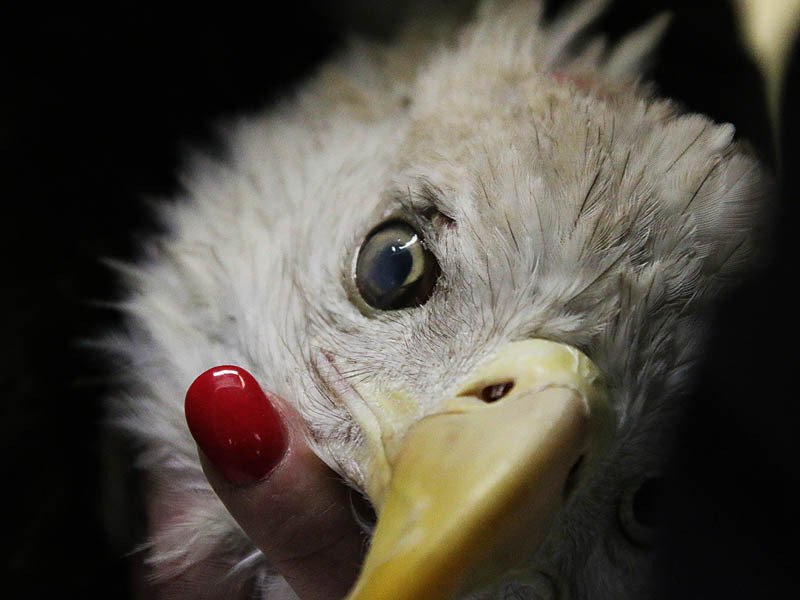 Bringing the eagle out to dress his wounds. After removing the bandage the wound was thoroughly cleaned. The leg was improving, but a full recovery would take much more time. The eagle tolerated these sessions well. Talons and feet are looking good. The injured eye was improving, but was still cloudy. 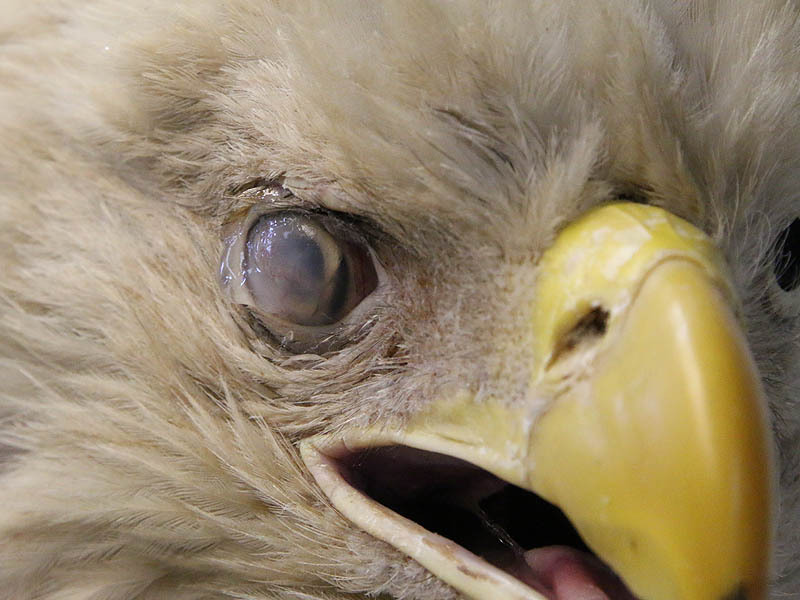 The pupil is visible and the eagle is now able to detect changes in light and dark. Ointment applied to the injured eye. Significant improvement in just a couple of months. 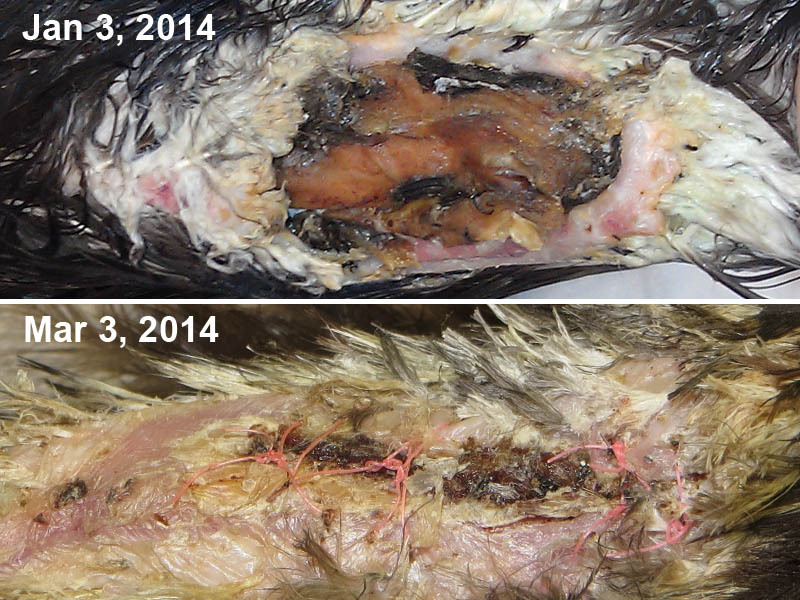 The leg injury was severe and challenging to treat. Eventually it did heal with no loss of functionality. 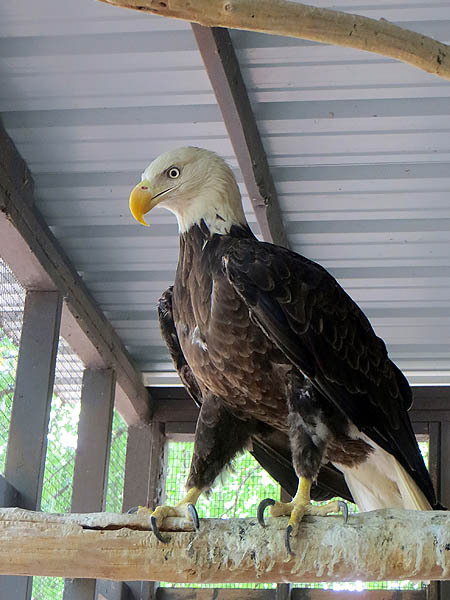 After about five months of treatment, the eagle was healthy and recovered enough to be transfered to a larger outdoor enclosure. The objective was to allow him room to move around and fly so that he could begin building strength for his eventual release. 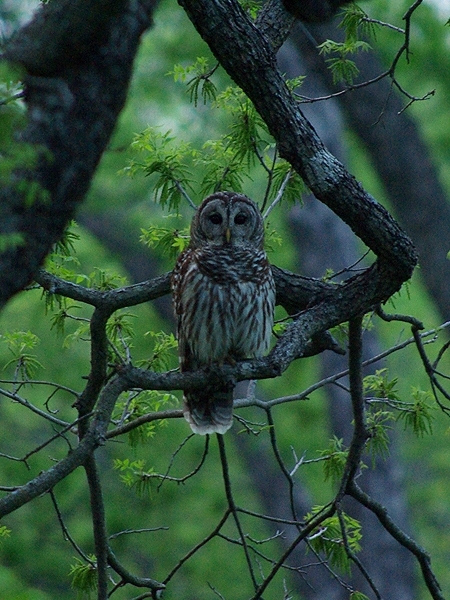 Keeping the bird outdoors also allowed him an opportunity to acclimate once again to the ever-changing weather conditions in North Texas. The eagle in his outdoor enclosure. Looking good! – photography by Penny Halstead. 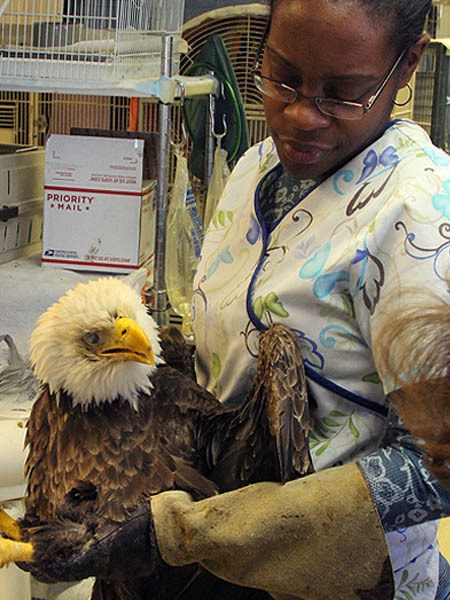 By October 2014 the Veterinarian overseeing the eagle’s care deemed the bird sufficiently recovered to be releasable. 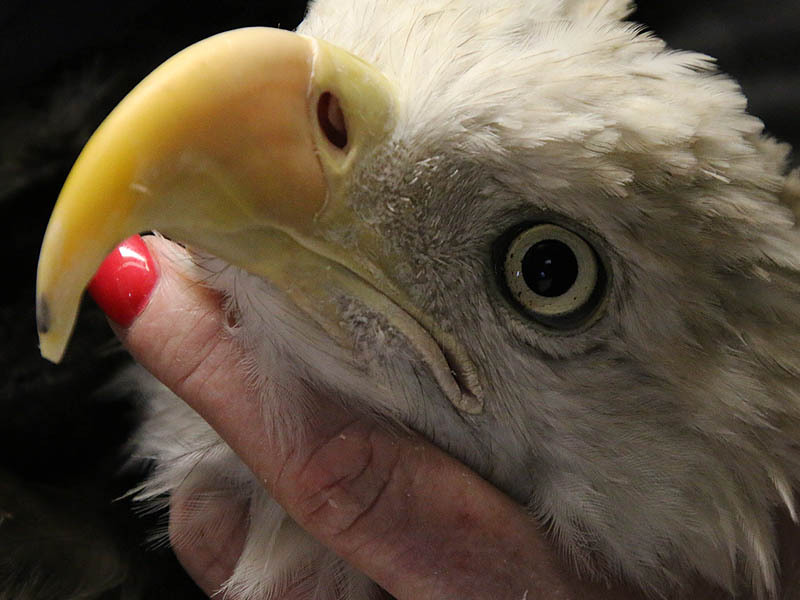 After months in captivity, however, the eagle would need a little conditioning to ensure he was physically fit enough to survive in the wild. His caretakers usually conducted creance training once a day. 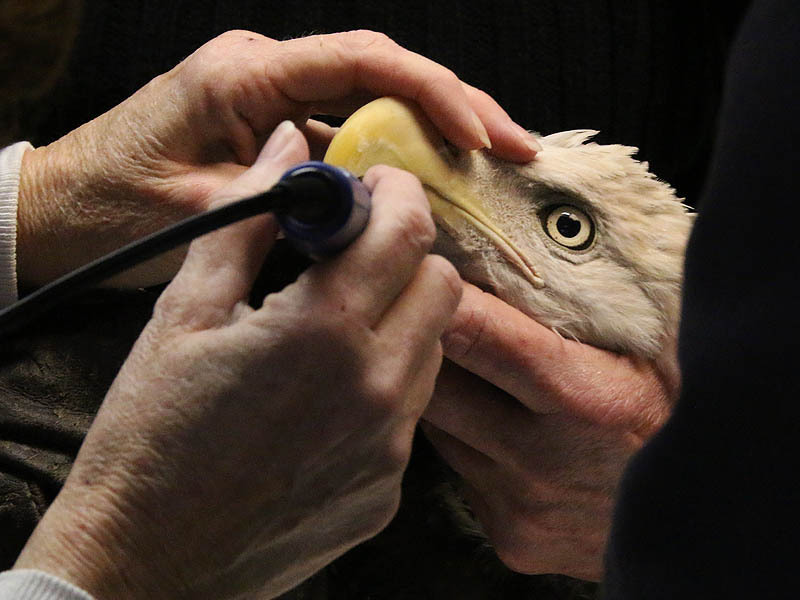 During these sessions the eagle would be flown 3 to 4 times. Early in the process these exercises would leave the bird exhausted, but he gained strength rapidly over the next couple of weeks and soon it was time to begin planning for his release back into the wild. Release – The Big Day! 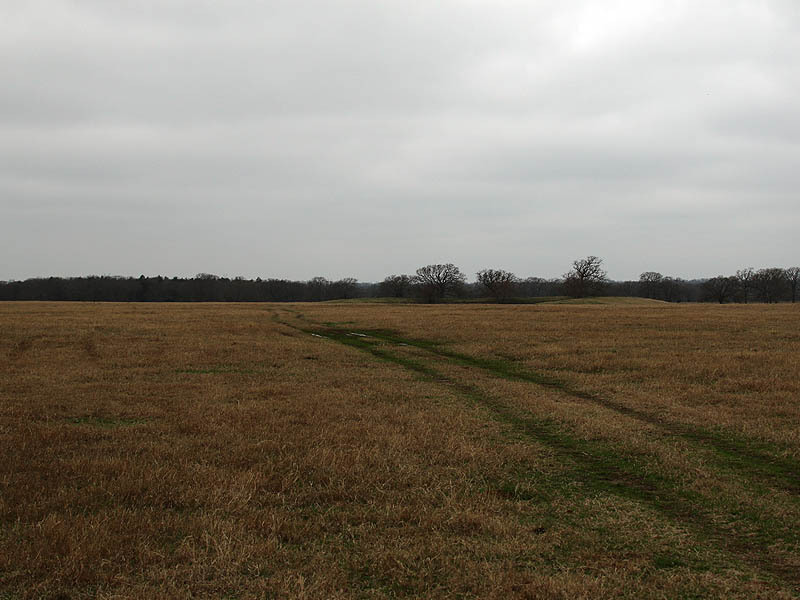 Several different North Texas locations were considered as possible reintroduction areas before a large ranch in Kaufman County was finally settled on. 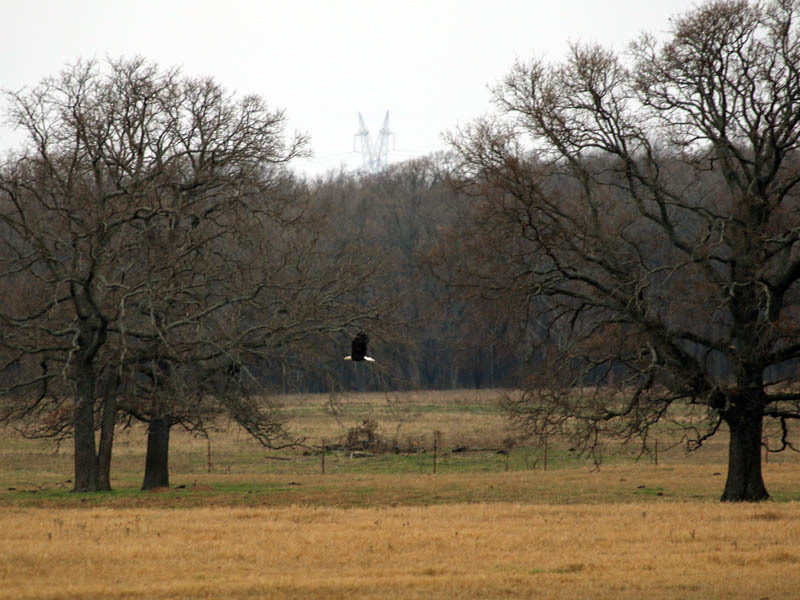 The ranch featured large open spaces, big skies, and a multitude of stocked lakes and ponds that would provide ample hunting opportunities for the eagle. 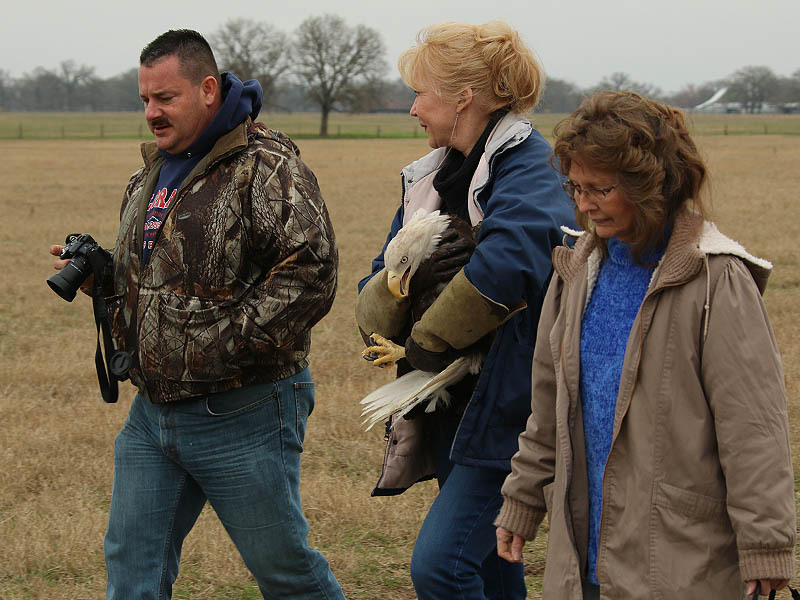 The staff at the ranch was also available to help keep and eye out for the released eagle. 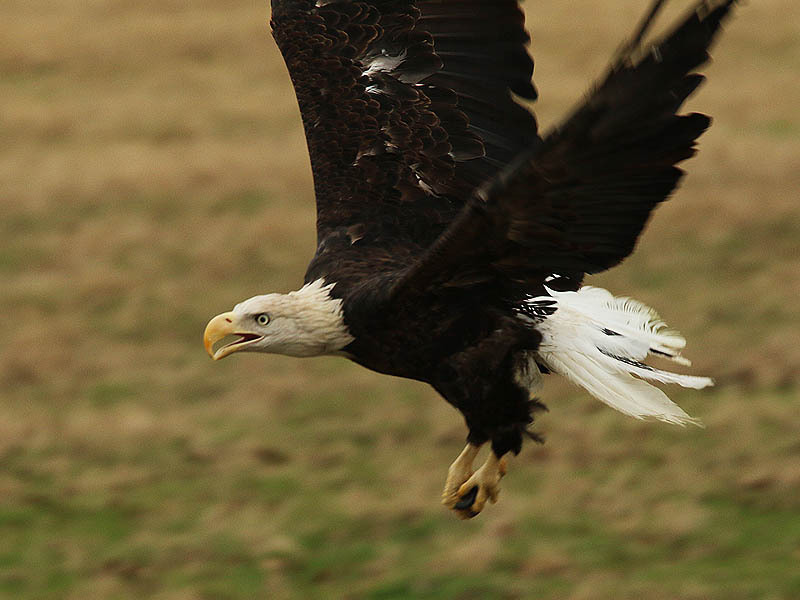 They would provide periodic updates on sightings and report on the eagle’s condition whenever they could. 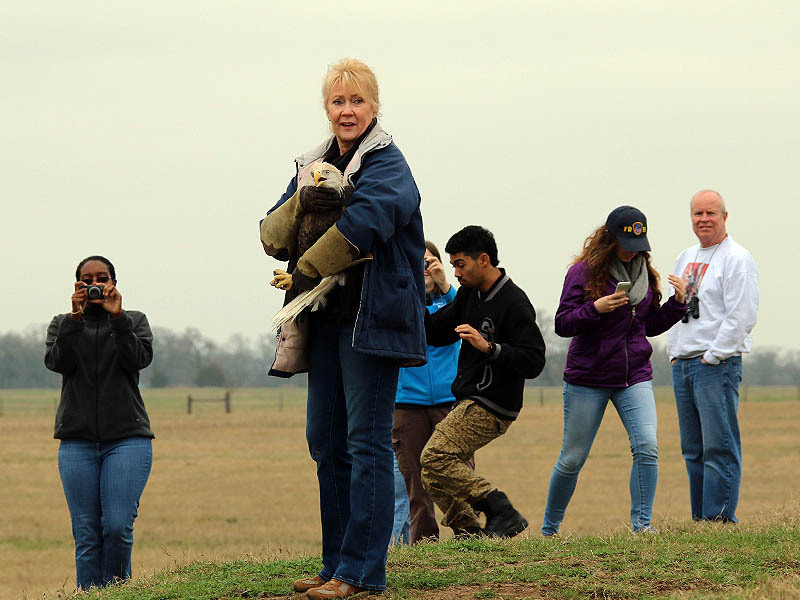 The date for the release was schedule for December 21, 2014—exactly one year from the day that the eagle first arrived at the RWRC. The eagle’s reintroduction into the wild was shaping up to be a big event. Many people had arrived at the center to be a part of it. 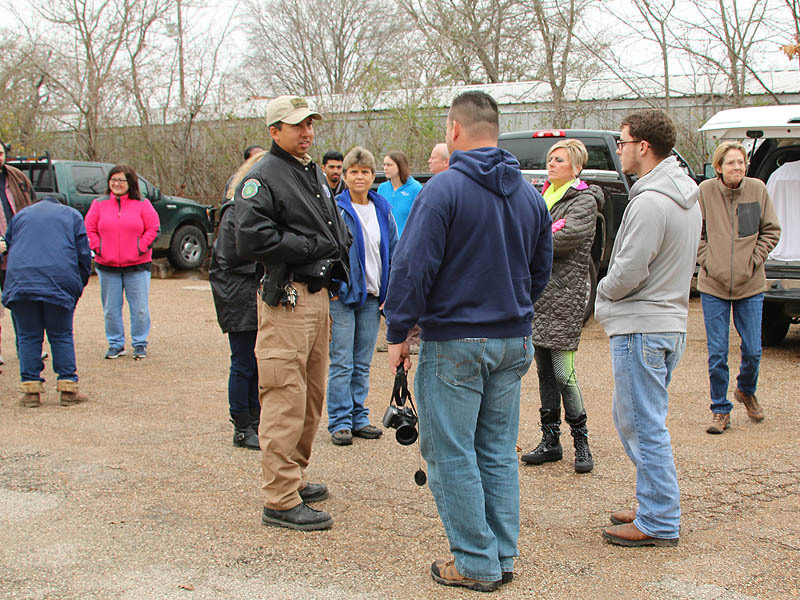 Graeme Geisendorff and Martin Oviedo—the TPWD Game Warden—were also present to view the release that they had helped facilitate. As I entered the clinic on this cool overcast morning, I found the staff of the RWRC busy with some last minute preparations. 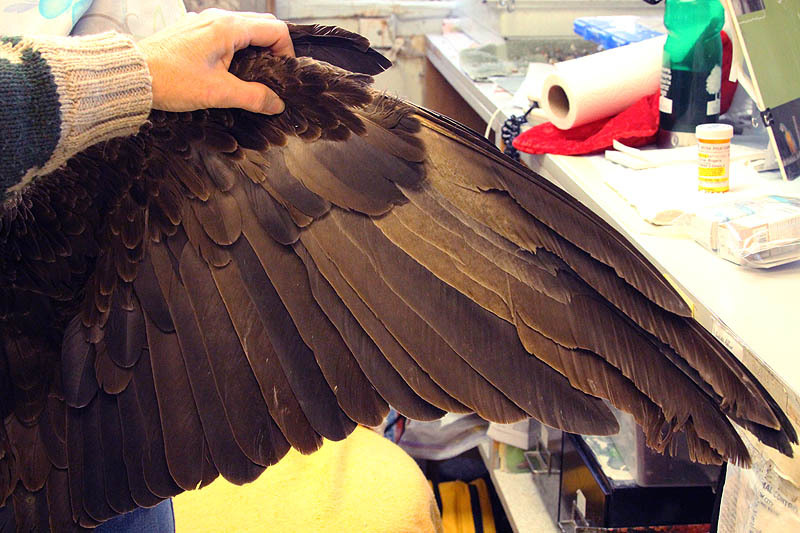 The eagle’s beak—which would normally be worn down by use in the wild—was being gently reshaped. 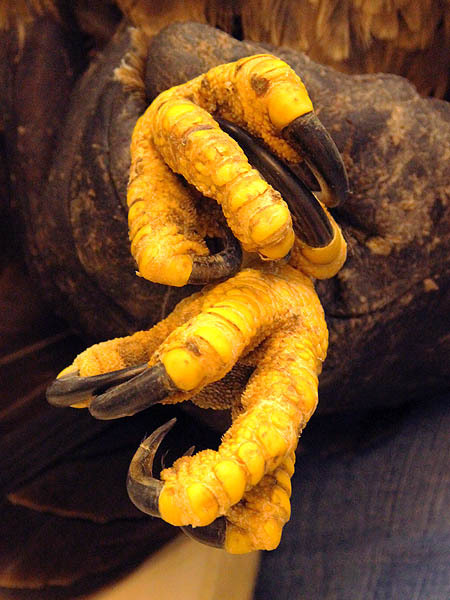 A little later Kathy applied an antifungal cream to help protect the eagle’s feet. 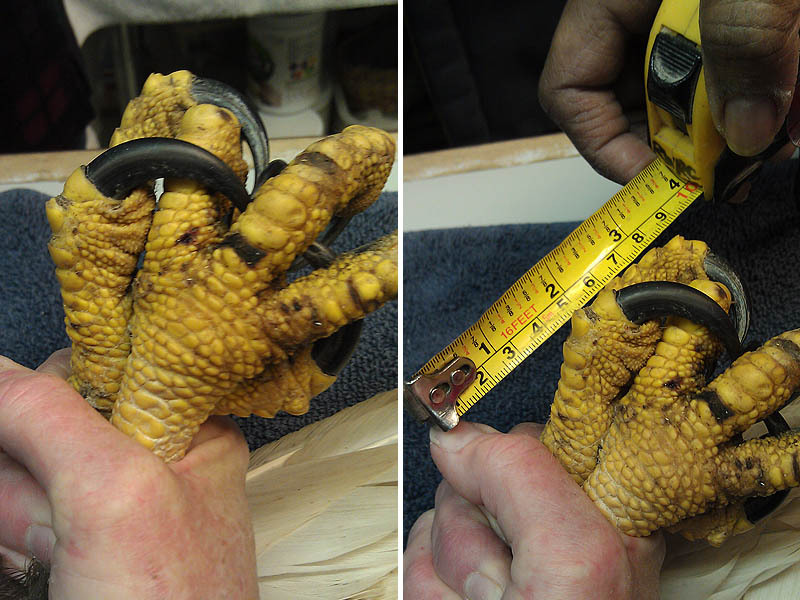 Touching up some over-growth on the eagle’s beak. Again I was amazed at the eagle’s tolerance of all of this attention. The injured eye will never be 100 percent again, but it is much improved. 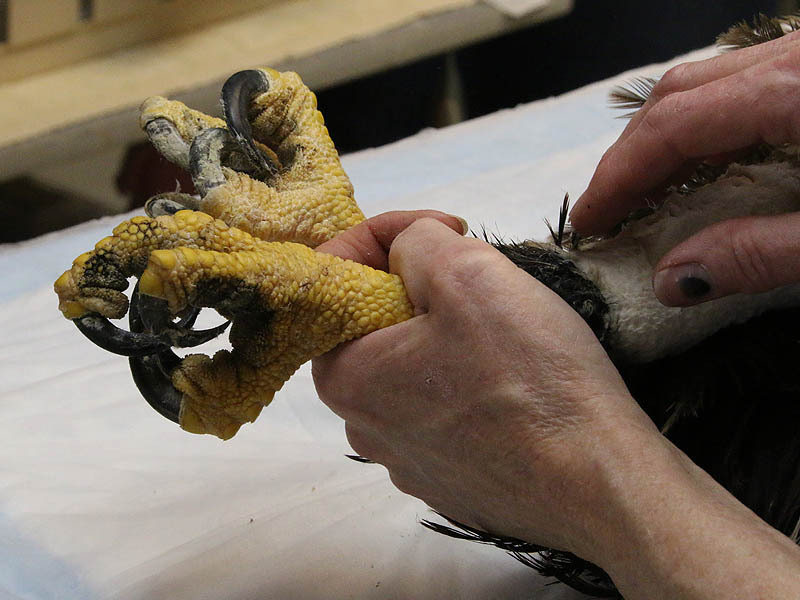 Applying an anti-fungal cream to the eagle’s feet. It was at this time that Kathy showed me the eagle’s unusual and distinctive new tail feathers. 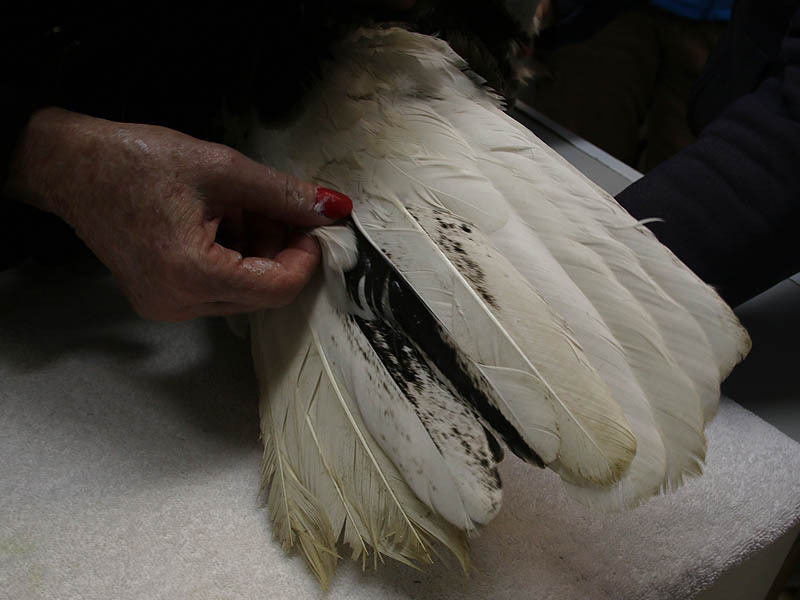 After the bird’s last molt, some of the normally uniformly white tail feathers grew back mottled with brown. 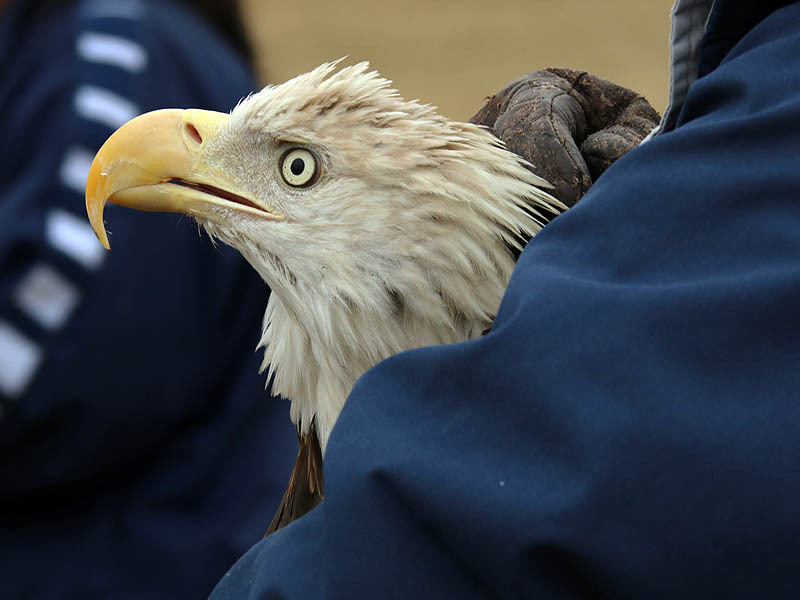 This fortuitous turn of events will help observers positively identify the rehabbed Bald Eagle for months after his release. 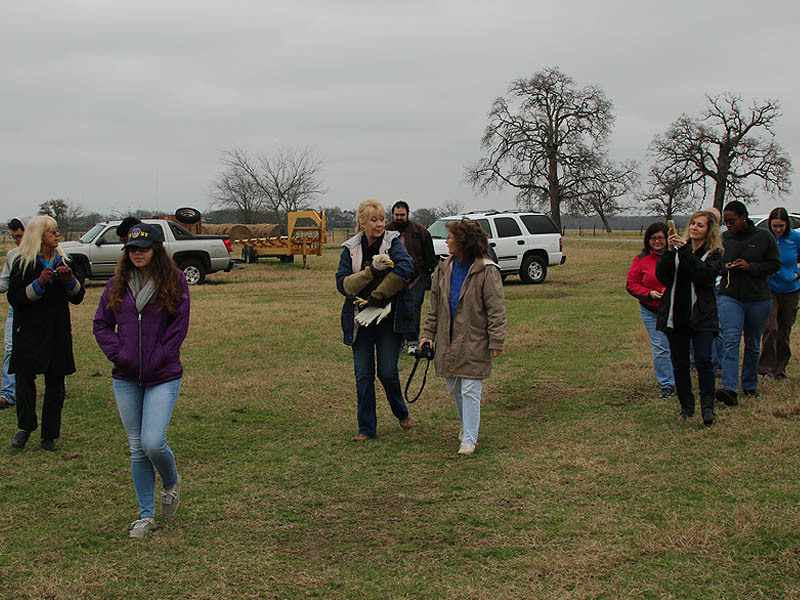 As the preparations began to wind down it was time to leave for the ranch in Kaufman County. 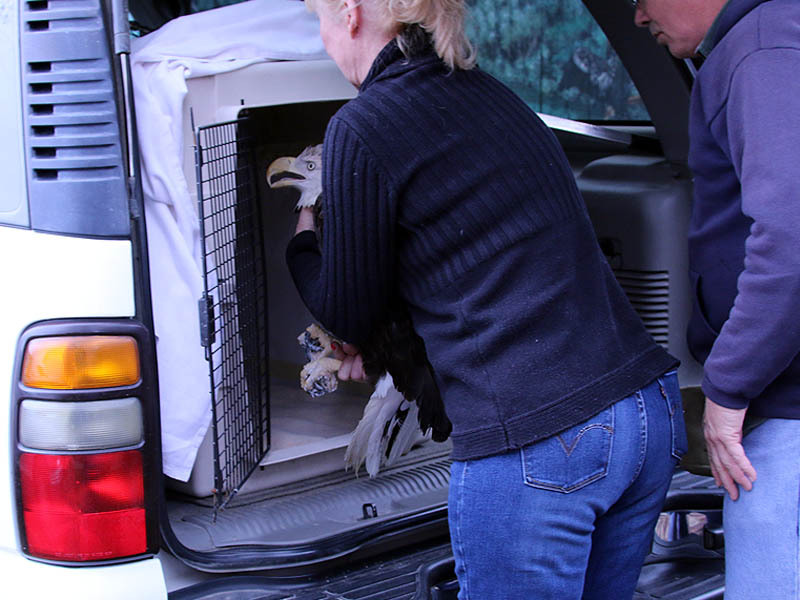 The eagle was loaded into a specially prepared kennel in the back of Kathy’s SUV and soon a long caravan of cars and trucks was pulling away from the Rogers Wildlife Rehabilitation Center. The unique and distinctive tail feathers. Loading the eagle for transport. The release was a big event. A lot of people were in attendance. 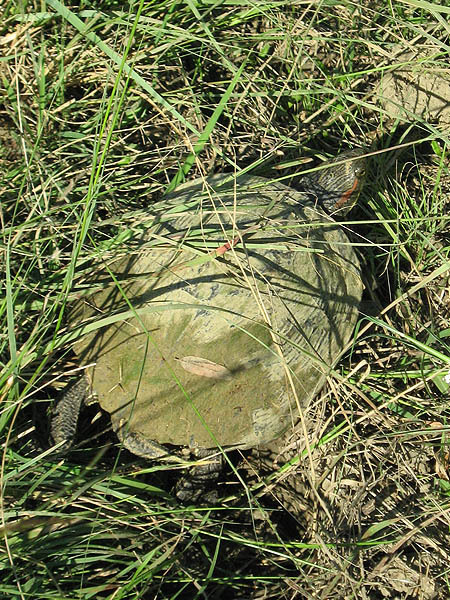 The game warden who assisted in the capture was present for the release. Game warden Martin Oviedo speaking with Graeme Geisendorff. We arrived at the ranch less than an hour later. It was just a little after noon, and there was still a slight chill in the air. The gloomy sky was covered with a thick, low blanket of gray clouds. 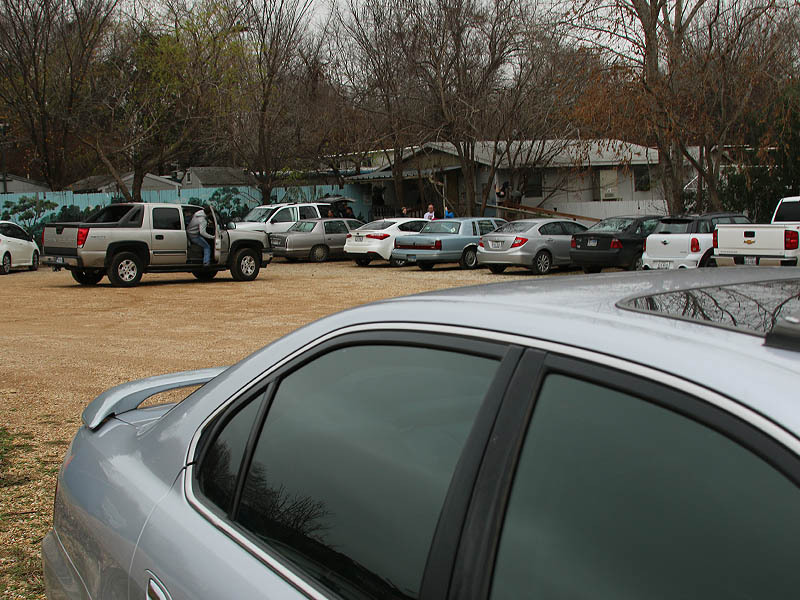 The caravan traveled for about a three quarters of a mile on the ranch property before we exited our cars. 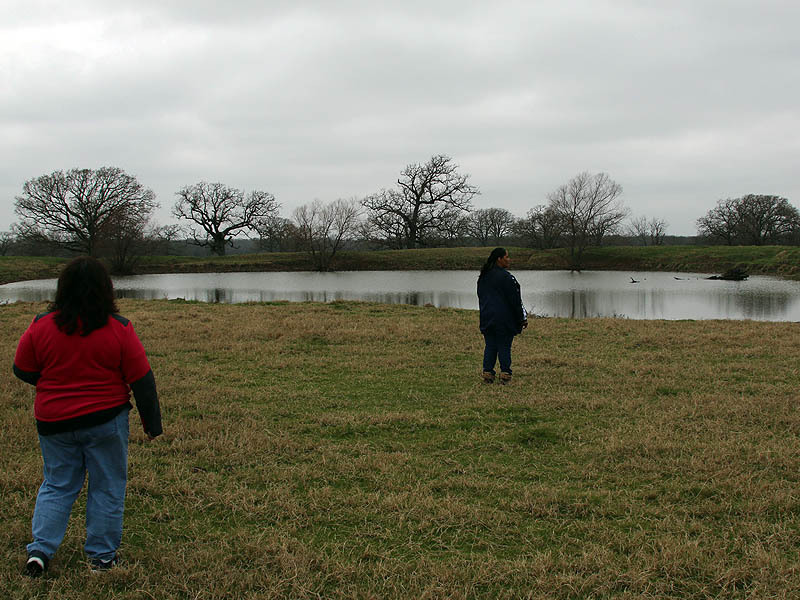 From this point there was still nearly a half mile walk required to reach the pond that was to be the location of the eagle’s release. Spirits were high as the large entourage made its way to the distant body of water. The excitement surrounding the release was palpable. It sometimes appeared that even the eagle was aware that something different and special was about to happen. 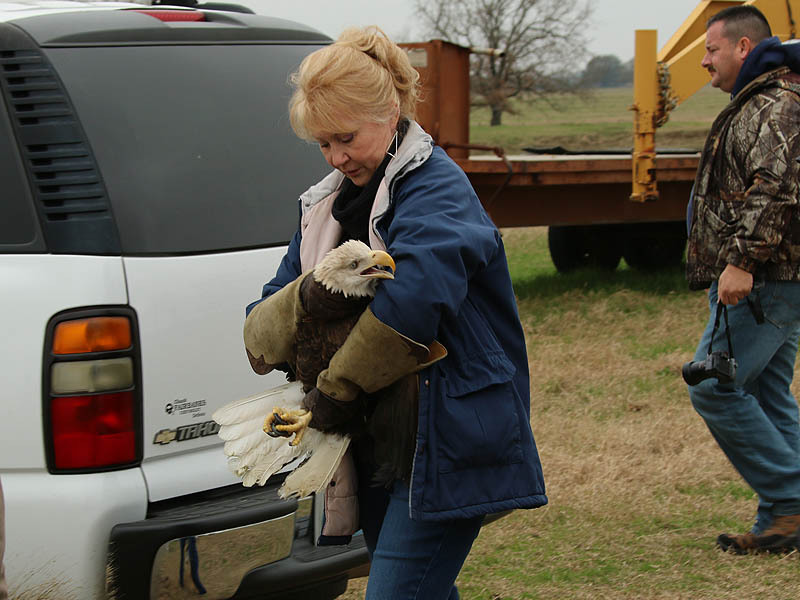 Carrying the eagle to the release site. Kathy and her colleague, Penny Halsted, discussing the release. 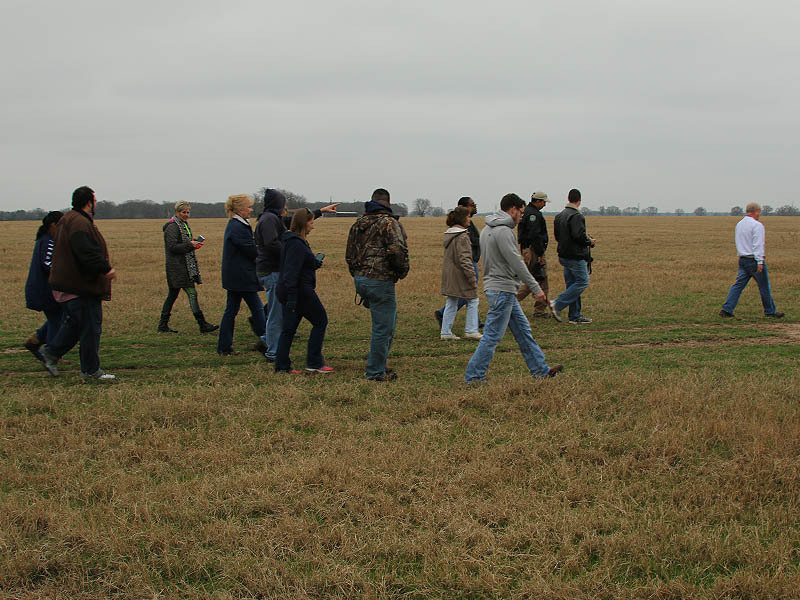 The long walk to the release site. Kathy paused briefly when we reached the pond to allow for a few more last minute closeup photographs. Afterwards we all moved into position for the release. Kathy walked up onto the pond’s retaining berm in order to be close to a set of trees she expected the eagle to perch on until he discovered he was untethered. The various photographers present all rushed to position themselves advantageously, hoping to get the best possible pictures of the exciting release. Kathy paused for a moment to allow for a few last minute closeup photographs. The eagle seemed to sense that something special was about to happen. 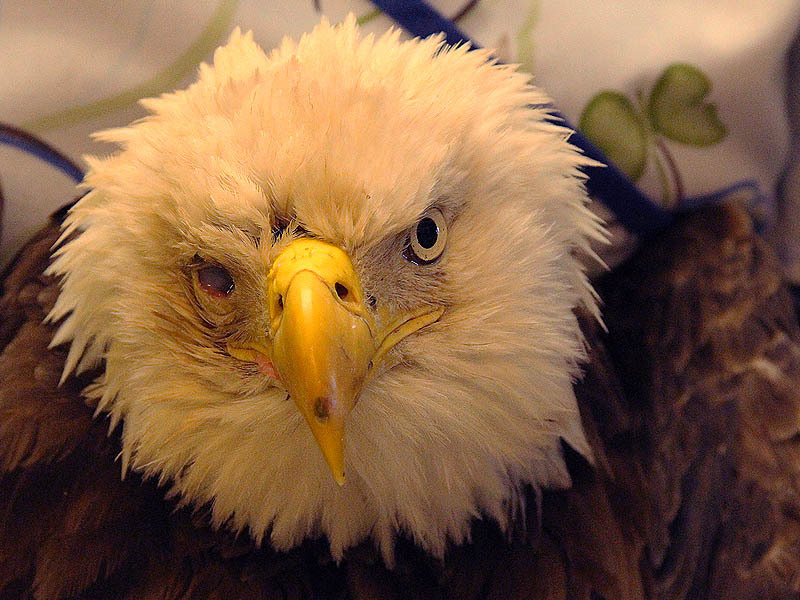 The eagle will have to overcome the challenge of limited vision in his injured eye. Walking up onto the retaining berm. Graeme led a brief blessing, and it was at last time to give the eagle his second chance. 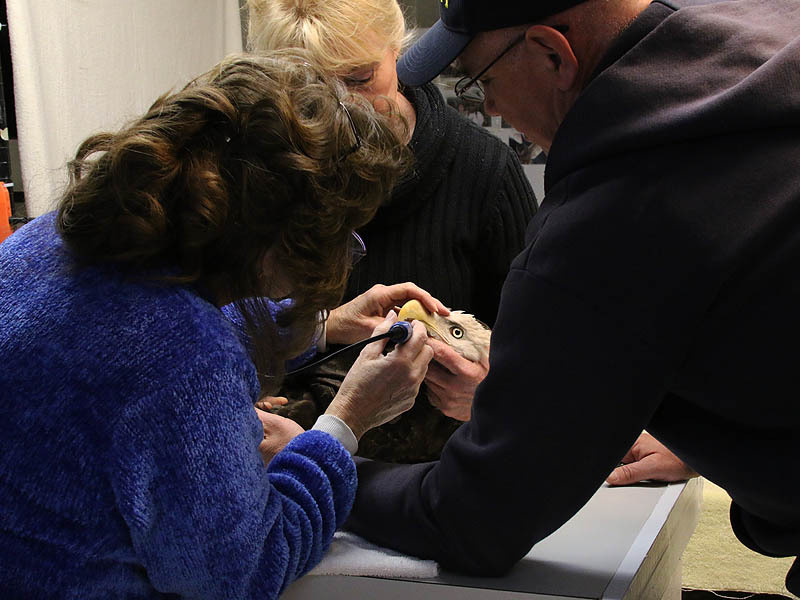 Releasing a rehabbed animal is never an easy thing to do. So much is invested in their care that the bonds of affection become difficult to break. The thought of an animal facing the dangers and challenges of life in the wild can be hard to come to terms with. 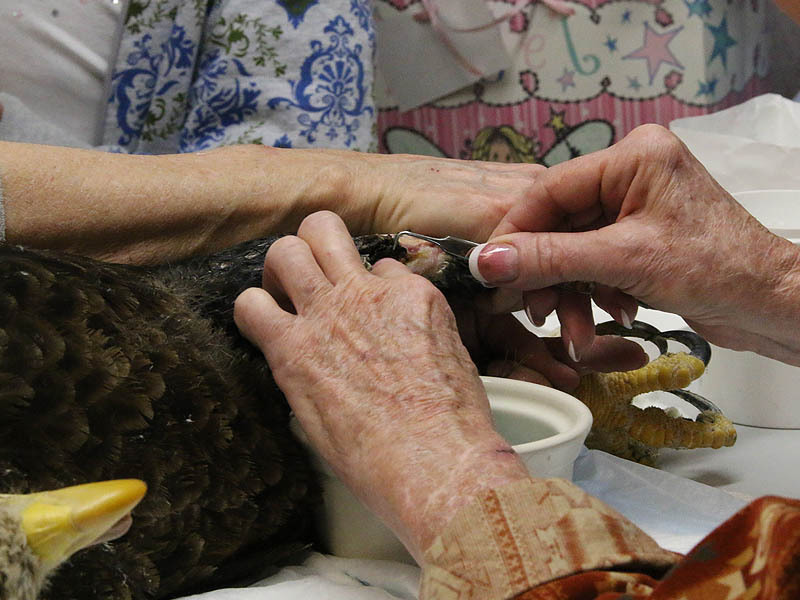 After a year of nursing this eagle back to health it took Kathy a moment to allow the attachments to this eagle to be broken. But Kathy has done this sort of thing before—time and time again. 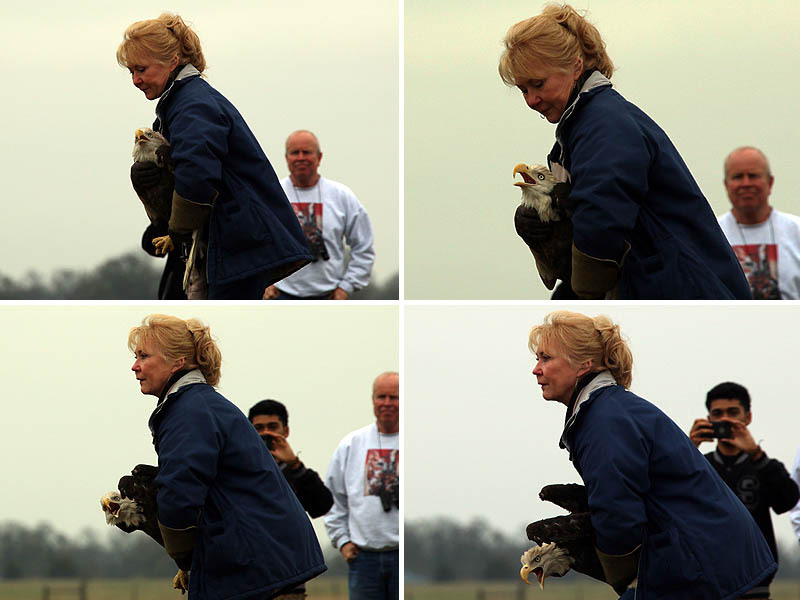 She knew this would be the best thing for the eagle no matter what the outcome. She said her goodbyes, wished the eagle well, and then tossed the majestic bird skyward, sending him on his way. In positions for the release. Saying goodbye and wishing well. The eagle seems to knows this is it! 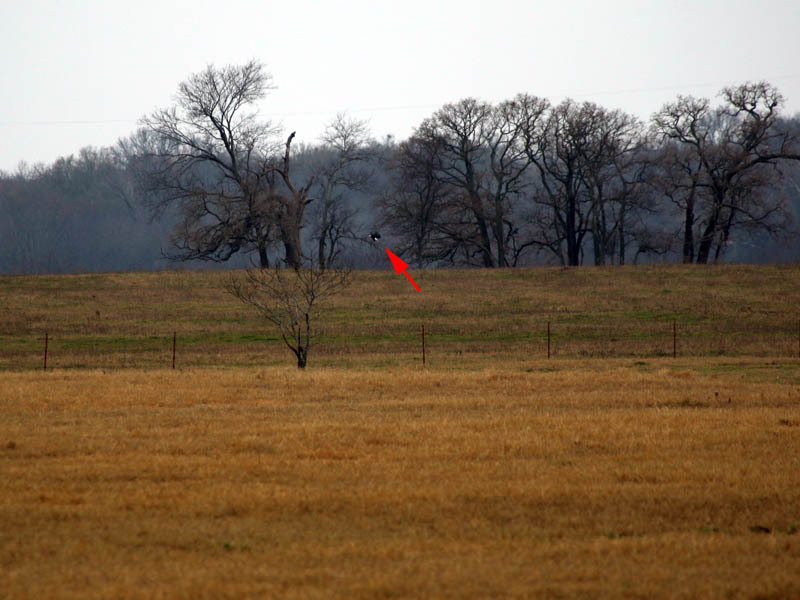 To everyone’s surprise the eagle did not light in one of the nearby trees as expected, but instead he beat his wings and soared far away to a distant tree line. A moment later he disappeared over a rise, and just like that it was over. 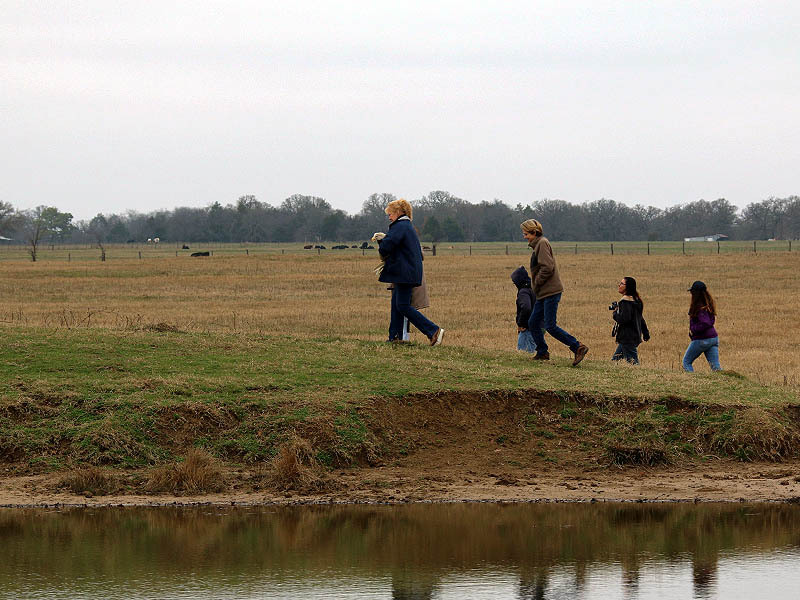 The walk back to the cars was filled with reminiscing and conversations about the eagle’s prospects in the wild. 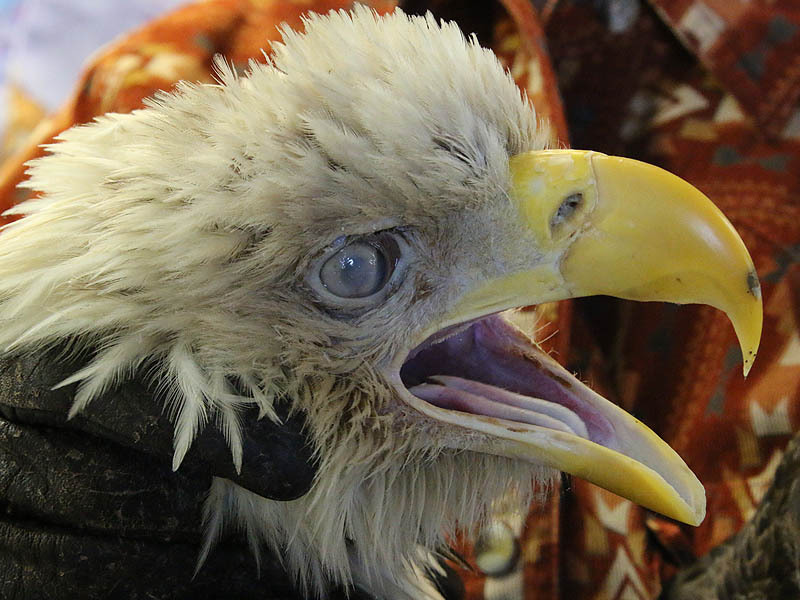 One question on everybody’s mind was can an eagle with just one good eye survive in the wild? The folks at Rogers Wildlife were certain he could. I was curious enough to research the possibility further. 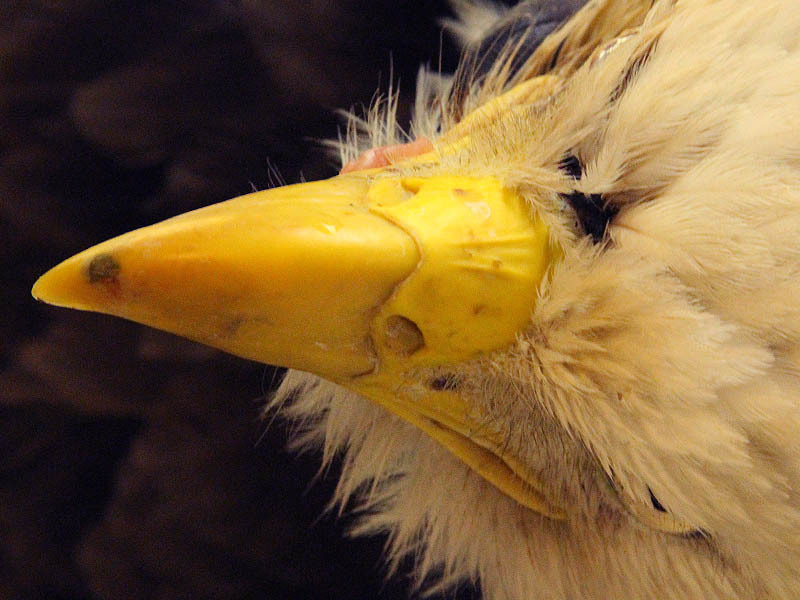 From everything I found, it appears that not only can an eagle compensate for the loss of an eye and survive, but there is a very real likelihood that the eagle will actually thrive. It is not unheard of for birds of prey—hawks, falcons, eagles, and other raptors—to survive in the wild for years after losing an eye. …the one-eyed female once caught two trout with one foot. She was a very impressive hunter when she needed to be. 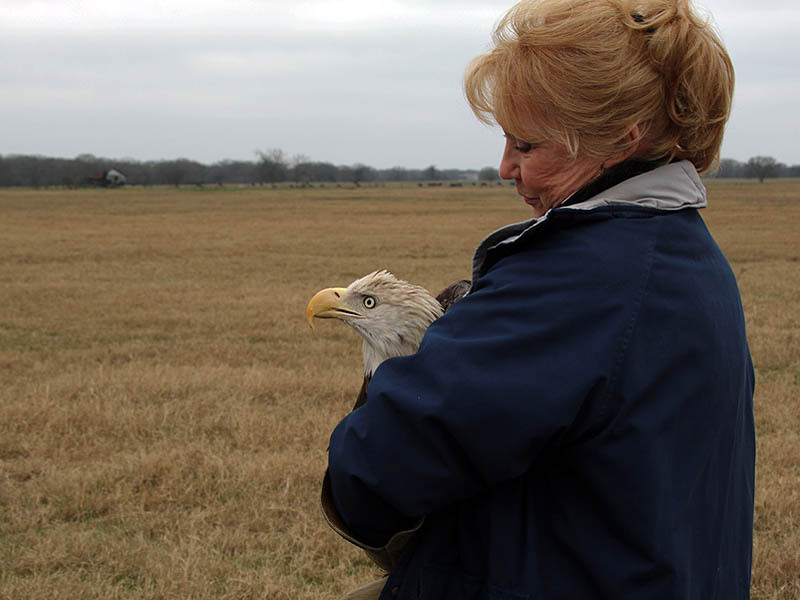 Below is an article written by another wildlife rehabilitator who rescued an eagle under similar conditions and circumstances to our Lake Ray Hubbard bird. 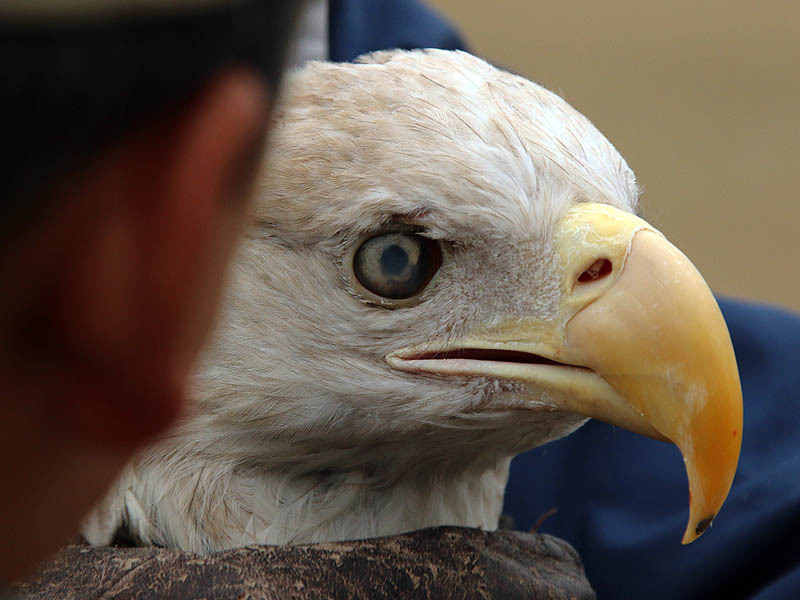 He was surprised to discover that the eagle in his care had actually loss the use of her eye many years prior to the rescue. So, it would seem that our eagle has been given an excellent opportunity for a second chance to live wild and free. 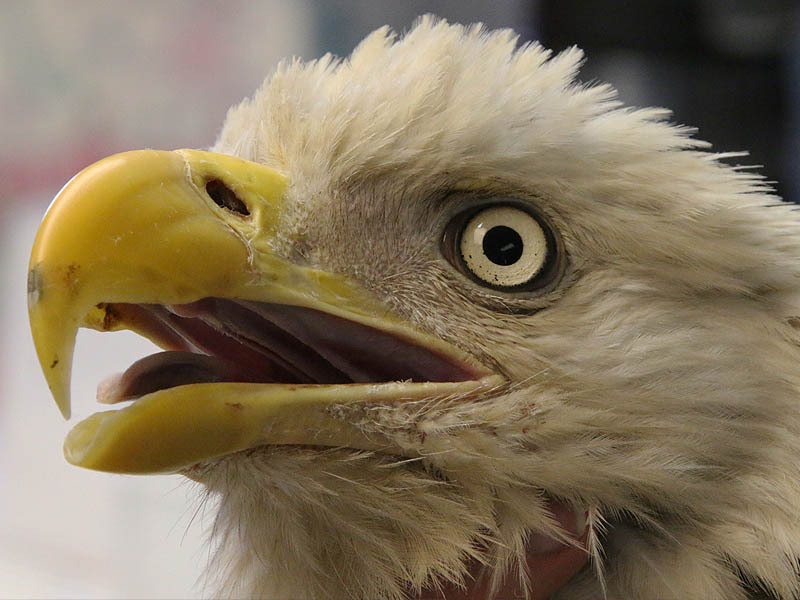 This Bald Eagle has come a long way since he was found near death over a year ago, and it was the hard work and dedication of the staff at Rogers Wildlife Rehabilitation Center that made the difference. 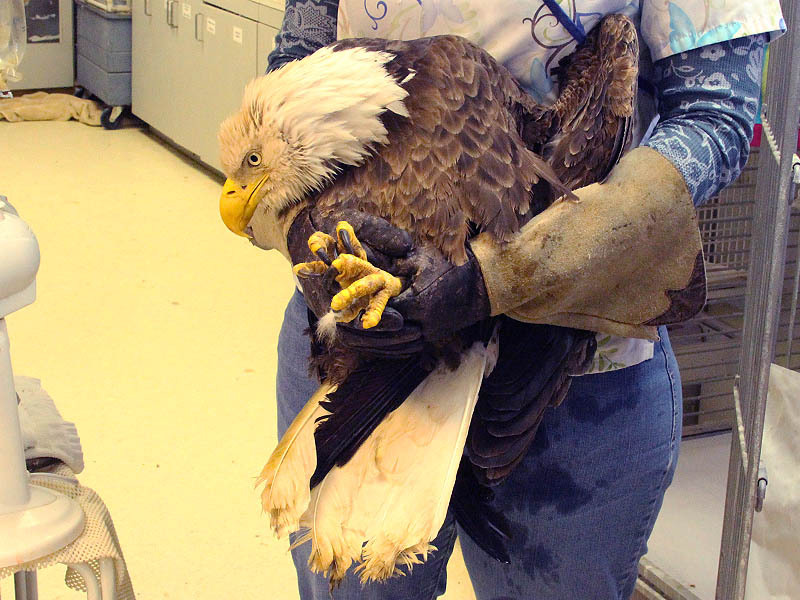 The recovery and release of the Lake Ray Hubbard Eagle was the result extraordinary efforts by all who were involved. It takes special people with a deep well of compassion and commitment to pull off a rescue like this one. 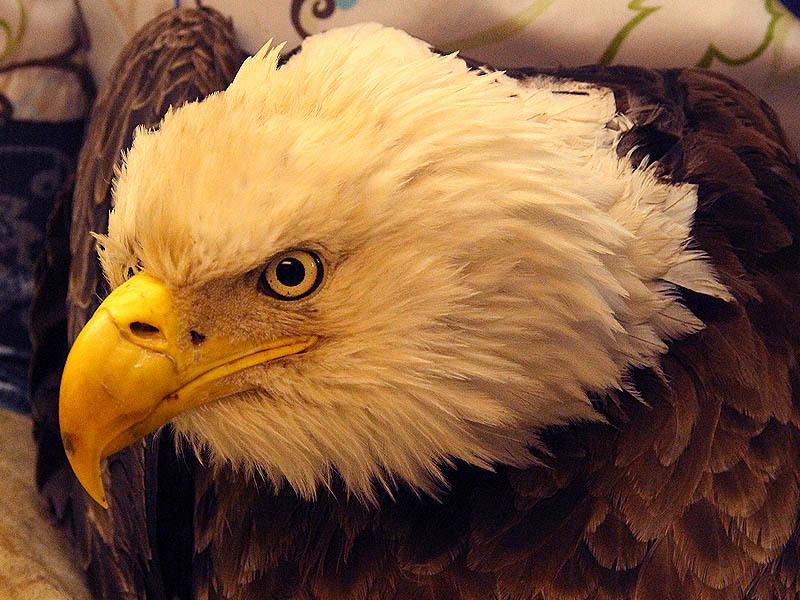 This story details blessings to all concerned—the humans and the eagle. May the effect of these blessings continue and multiply in all their lives.